Registration for our 8-week Summer Session will start April 1st. Scroll through the class options below and click the blue "register" link to enroll. You'll have the option to select how you would like to pay the subsequent monthly tuition payments. Camps and workshops are for a set time rather than the full 8-week session. They are a great way to try something new! Tuition for the entire camp/workshop is listed at far right. Dance with Me is for the tiniest of dancers ages 2 & up. This class is structured like a Creative Movement class, but a parent or caregiver attends the class with the child. Creative Movement is for dancers ages 3 & up who are ready to do a class without mom or dad! This 30 minute class is a great way to explore movement in the classroom setting. Lots of props, lots of music, and lots of fun!! Combo classes are for dancers ages nearly 5 to 7. This 45 minute class combines tap, ballet, and jazz in an exciting overview of dance with age-appropriate progression of skills. Each age has their own specific Combo Level so that dancers are grouped with other dancers of their same age/grade. Combo dancers perform in the Annual Spring Recital. 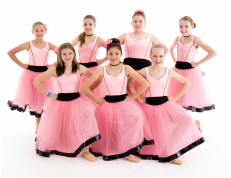 Open Level Classes are perfect for an older beginner, or a recreational dancer. They are not categorized by level but by age. It may be a good fit for a dancer that does not want to take ballet, but still wants to take a jazz, hip-hop or tap. In general, dancers spend about 2-3 years in each of the Open Level age groups: Kids, Pre-Teen, Teen, Adult. Dancers in 2nd grade & up may enter into our leveled technique classes where they can study one or more specific styles of dance. Dancers begin in Level I. In general, a dancer spends 2 years in each level. If a student plans to progress through levels of training, ballet is strongly recommended and will become necessary at Level III*. *Any student in a Level III, IV, or V class must be enrolled in Ballet at least once a week. Ages 8+. Great exercise and lots of fun! Landing Dance Collective is a group of young dancers, ages 9 to 18 years old, who are students of the Landing Dance Academy in Cadillac, Michigan. Students are trained in dance disciplines & learn choreography. Company members perform locally and regionally, representing the surrounding school districts. Students will promote professionalism, diligence, and kindness with the movement arts. Auditions are held in June. Ballet classes feature a commitment to proper technique and skill advancement. Class placement will be based on age and teacher recommendation based on skill level. Jazz/Hip-Hop is a great way to further your dance experience, or just have fun! A variety of styles will be explored, including Hip-Hop, Contemporary and Lyrical. Pre-teen/Teen classes are equivalent to a Level I or II class. They are designed so that older beginning students can learn at a pace appropriate to their age. LEAP classes are equivalent to a Level III class. LEAP is based on teacher recommendation. They are designed so that older students can progress at a faster pace with students their own age. Adult classes are open level and do not require any previous experience.